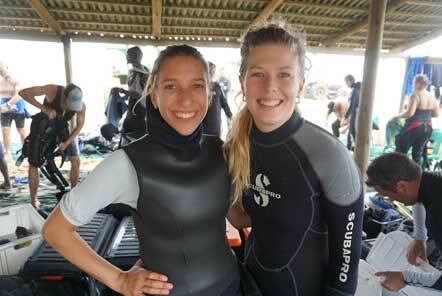 Ellie from the Pod Team shares her experience of the Marine Conservation project in South Africa. The Marine Conservation research team in Sodwana Bay collect data on turtles, rays, sharks, groupers and other marine life and contribute to research which aims to identify the migratory patterns and population densities of megafauna in the area. This research is crucial for the protection of the marine park and the reefs that span much of Southern Africa. As well as contributing to this important cause, being part of the research team also means diving every day in an extremely beautiful part of the world – what more could you want?! My adventure begins when I meet the team in Richards Bay. We jump in the car and make the 2 hour drive to the iSamangaliso National Park where the project is located. The drive is a great way to see some of South Africa, and we pass through many bustling townships and beautiful areas of the national park as we make our way up the coast. 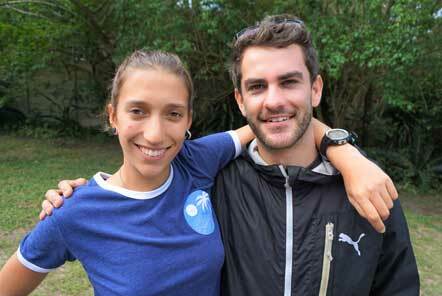 When we arrive at the camp and we are given our induction by our very lovely volunteer coordinators Emelia and Nick. They are both Dive masters and spend lots of time with volunteers during their placements, helping out with dives, giving lectures and helping to input dive data each afternoon. During our induction we are given a tour of camp, which is home to both marine conservation and social care volunteers. The main volunteer house and diver’s cabins are nestled amongst the trees, with a swimming pool and fire pit in the middle of the camp, it feels like a small tropical paradise! 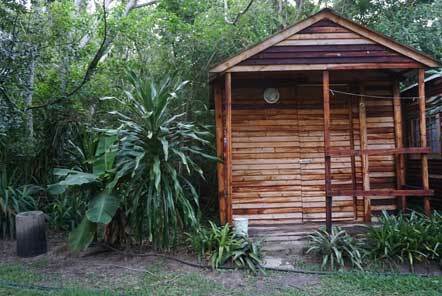 The camp is 10 minutes away from Sodwana Town which is popular with tourists keen on surfing, diving and fishing. For a small town it has lots of bars and restaurants and has a nice buzz of people coming and going to and from the beach. The next day we get into the full swing of diving! 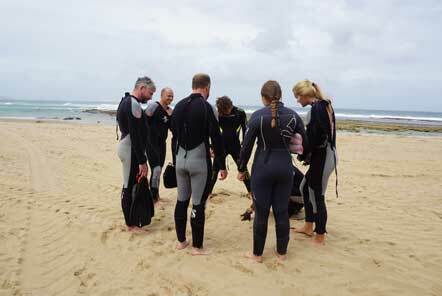 Beginners will spend their first week completing their open water course, whilst those with dive experience will have a refresher dive in the pool and then dive (excuse the pun) straight into their more advanced courses and conservation work. After a few hours in the pool learning or recapping the basics, we head down to the beach to set up for our first dive which will be a 12m dive at a site on the reef 2 miles from the coast. 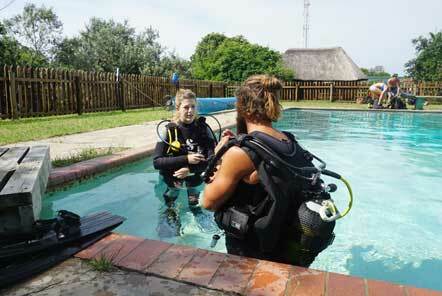 Emelia gathers the divers together and briefs us on the route we will be taking underwater. Although this is our first dive, we are still going to take photos and note down any unusual species we see on the reef. The iSamangilo marine park is home to the most diverse species of fish in the world, so there is the opportunity to see a huge amount! The main things we are looking for on our dive are turtles, whale sharks and groupers, but other fauna are also recorded so that we can learn about their migratory patterns and how they are behaving on the reef. During this first dive we were lucky enough to have sightings of 3 leatherback turtles! We take videos of these sightings so we are able to identify the turtles and upload the data later in the day. Volunteers spend the mornings diving and the afternoons uploading data and learning about marine ecology in Emelia’s lecture series. Emelia has a real passion for marine life and it’s infectious! 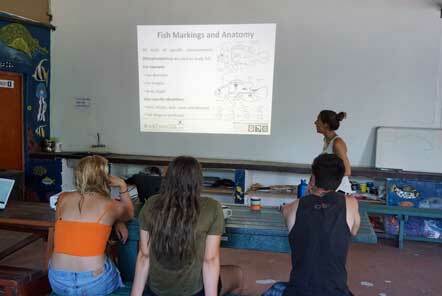 Today’s lecture in fish ID and is immensely helpful for volunteers, helping to identify the fauna that they will see on the reef every day. It’s been a beautifully clear day, so we head down to the beach to watch the sunset. We have a braii for dinner and eat around the fire before falling into bed exhausted, ready to be up early for diving in the morning! 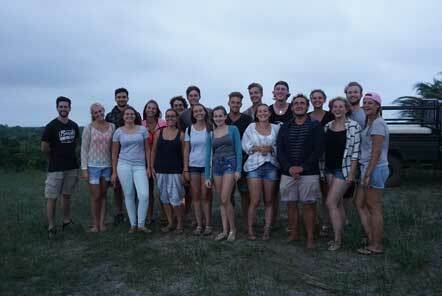 You can find out more about the Marine Conservation project in South Africa here.